Aikido is a Japanese form of martial art based on the principles of universal harmony created by Morihei Ueshiba (1883-1969; also known as O’Sensei or “Great Teacher”). Aikido can be translated as ‘The way of Harmony with Ki’ (Ai: Harmony, Ki: Eastern concept of life force or breath, Do: The Way). O’Sensei was a deeply spiritual man and conceived Aikido with a humanistic philosophy. It is much more than simply a method of self-defence, because to O’Sensei, true victory is never just defeating one’s opponents, but the resolution of conflict within oneself. He believed that ‘True budo is the way of great harmony and great love for all beings; it is to be one with the Universe. Aikido is essentially non-violent and non-competitive. Force is never opposed with force. In handling an attack, an Aikidoka will maintain centered and move in to harmonize with the attacking force, guiding it with flowing circular motions to control and overcome the attacker. A variety of techniques may then be applied, in the form of locks or throws. Aikido is a graceful yet highly effective form of martial art, drawing its effectiveness from technical precision, timing, and mind-body-spirit coordination. Therefore, possible to defend oneself from an opponent of superior size and strength using soft, smooth and fluid movements. Aikido promotes self-discipline and respects each other. Develops physical fitness and stamina. Promotes a sharp, calm, focused, yet humble and flexible mind. Self-defence – Defend themselves from an opponent of superior size and strength using soft, smooth and circular movements. An excellent way of restoring flexibility and preserving healthy body. Creating an inner peace and helps to balance our daily lives, to become a better and more effective person. Aikido is suitable for any age people; children women and elderly too. Aikido is suitable for people of all ages, including children and elderly people. Aikido classes for children (from ages 6-13 years) are good for attention training and instilling self-discipline. During training, practice is done with a partner in a cooperative way to help each other understand the movements, and the senior graders are always there to help the juniors. When you join, expect a lot of hard work and also a lot of fun. With consistent practice, you might eventually earn your 1st degree black belt (1st Dan) after 4 to 5 years but do keep in mind that this is typically only considered as one’s birth into Aikido, the fun has just begun! Aikido was developed by O’Sensei in the 1920’s after his years of study in various martial arts, particularly the different forms of Jujitsu. It is also much influenced in its philosophy by O’Sensei’s spiritual practices and religious inclinations. As O’Sensei had many students who trained under him through the various stages of his life, different students interpreted his Aikido in different ways and many styles of Aikido were formed and practiced in the world today. Each style has its own strengths and weaknesses, but we may say that most are rooted in the basic principles of Aikido. Officially recognized by the Japanese government in 1940, the Aikikai Foundation was founded in order to preserve and promote the ideals of Aikido created by O’Sesei. As the Aikido World Headquarters, it is the parent organization for developing and expanding Aikido throughout the world. 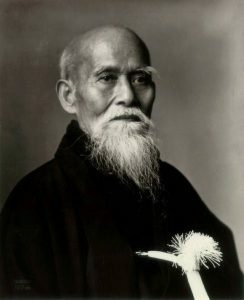 After O’Sensei’s passing in 1969, his son, Kisshomaru Ueshiba (1921 – 1999) was inaugurated as Aikido Doshu. At present, Moriteru Ueshiba (1951 - ), grandson of the Founder, has succeeded his father as Aikido Doshu. The Aikido World Headquarters is also known as the ‘Hombu Dojo’ and located in Shinjuku, Tokyo, where classes are conducted daily. Instructors from Aikido World Headquarters are dispatched to countries throughout the world to promote the art. Today, it is estimated that Aikido is practiced by over 1.7 million people in more than 130 countries around the world. Aikido’s popularity clearly transcends boundaries of race and nationality, because people are attracted by the underlying Aikido philosophy of harmony and love. In 1975, in order to united Aikido practitioners from around the world, the International Aikido Federation (IAF) was formed to organized Aikido Activities on a global scale.